Most of us are familiar with transient processors that can shape the attack and release characteristics of percussive sounds — but Oxford Envolution goes much further. Many of our readers will be familiar with the SPL Transient Designer. Originally a hardware processor and later emulated in software plug-in form, it allows independent control over the attack and release characteristics of a percussive sound, without the user needing to set a threshold. 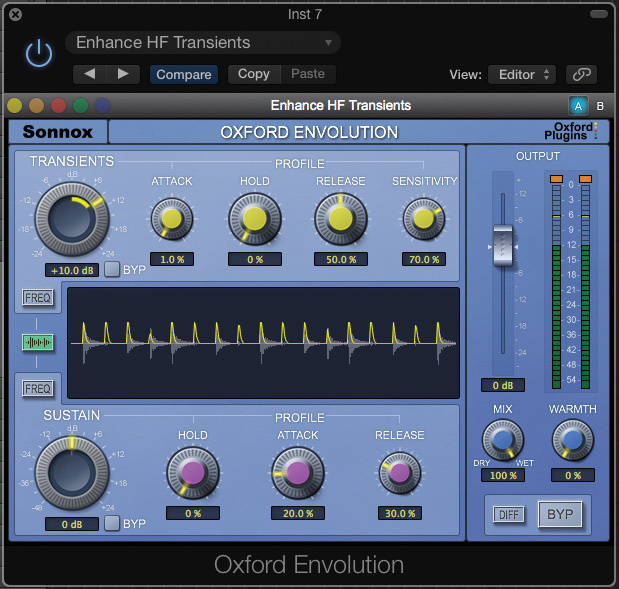 The Sonnox Oxford Envolution plug-in takes this concept and runs with it, providing detailed and separate control over transients and sustain and allowing attack, hold and release times to be adjusted independently. What’s more, the processing can also be made frequency-dependent, which can be useful in tackling issues that affect only a certain part of the spectrum. This processing doesn’t use the usual band-splitting and there are no FIR filters, which means that it can be used in a parallel routing configuration without you having to worry about phase cancellation or long latency. All the usual native plug-in formats are supported, and there’s also an AAX DSP version for those running Pro Tools HDX rigs. An iLok account is needed for authorisation. 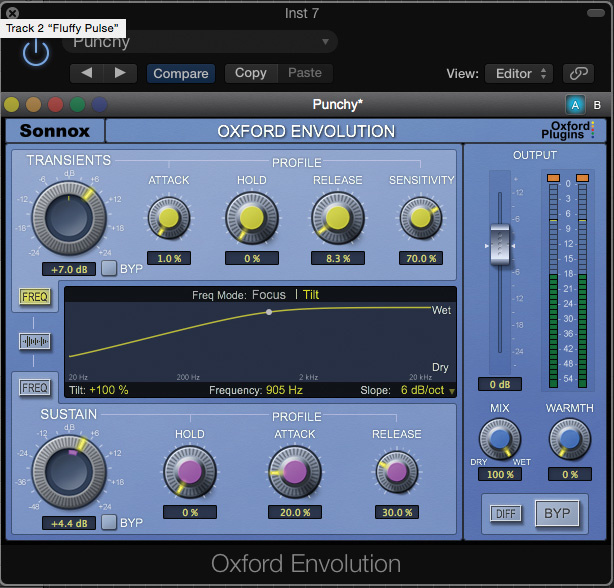 Sonnox have done as much as possible to take the hard work out of setting this plug-in up, so it automatically adjusts its detection and processing time constants according to the characteristics of the input signal. There’s also a decent library of factory presets, which cover many eventualities as well as providing an insight into how best to adjust the plug-in. Two main level controls allow independent adjustment of the transient and sustain components of the input signal. Each knob contains a circular meter display which shows the varying level of the gain envelope. Envolution’s main display, in the centre of the window, can be switched between several different views. One of these is a type of oscilloscope showing the audio waveform overlaid with the attack and release envelopes, which provides very useful feedback as to what the process is achieving. By default, the envelope scope scrolls smoothly from right to left, but you can switch to a bar-sync mode for tempo-controlled projects. It is also possible to freeze the scope display for closer examination by clicking anywhere inside the scope display. Alternatively, the display section can be used to view the frequency curves for the attack and release processing. In the Transients section, there’s an attack time control that can be slowed to allow some of the existing transient to pass through before gain reduction kicks in, much like the same control on a compressor. Slower attack times also help the processor ignore small, brief transients in busy signals. The hold control works as expected — by delaying the onset of the release phase — and can be useful in reducing the amount of gain variation taking place when several transients are very closely spaced. Release smooths the release portion of the attack transient envelope, while the sensitivity control determines the extent to which low-level transients affect the gain envelope. As the sensitivity is increased, more lower-level transient events are detected, but if you go too far in this direction, gain fluctuations can become audible. In the Sustain section, the hold control delays the start of the sustain envelope; the sustain control itself works in conjunction with hold to allow the sustain envelope to start later, so that only the decay part of the waveform is treated. An attack control smooths the start of the sustain envelope so that, as the attack time is increased, the sustain processing takes longer to reach the level set by the main sustain level control. The controls described so far allow the user to make the attack of a percussive sound more pronounced or more subdued, while the release portion of a sound can be made short and tight or long and sustained. In practical terms, this lets drum or plucked sounds be made long and roomy or short and tight, with harder or softer impacts on the initial transient. Up to this point, there are plenty of other plug-ins offering similar features, but Oxford Envolution’s spectral shaping is what takes its capabilities beyond basic transient design. Oxford Envolution’s ability to target or weight its response to different areas of the frequency spectrum greatly increases its versatility. The Frequency Mix controls enable the effect of the transient and sustain processes to be varied across different frequency ranges. The Freq button brings up the frequency display, which shows up as a curve with a single adjustment point. There’s a choice of band-pass type ‘Focus’ filtering or a Tilt filter, which can apply a high- or low-frequency bias across the entire spectrum. Tilt mode defaults to a 6dB/octave slope; this can be varied, and at its maximum setting in either direction, the response changes to a straightforward low-pass or high-pass filter. Tilt mode is particularly useful for minimising side-effects on cymbals when processing drum mixes: the Sustain Frequency Mix can rein in the effect of processing in the high-frequency region while the Transient Frequency Mix does the same for the low-frequency region. Focus mode switches to a band-pass or notch response, allowing specific frequency bands to be targeted for processing, such as reducing resonant frequencies in the sustain of a drum, or adding weight to an instrument that lacks it. While it is perhaps natural to think of transient/sustain-shaping processors as being primarily tools for treating drum tracks, they can be very useful with many other kinds of sounds too. Anything with a fairly fast attack followed by a decay can be processed — for example, bass guitars played with excess sustain can be made to sound a lot tighter, and picked guitar or piano-like sounds can also benefit, depending on how musically dense the parts are. I was an early adopter of the original SPL Transient Designer, which has the advantage of two-knob simplicity. If you just stick to the basic controls, then Envolution does much the same thing as a Transient Designer — but it also permits much more forensic control if you’re prepared to learn how best to use the additional parameters. This means you can start out by making simple adjustments, and once you’ve mastered the basics, take your time easing yourself into familiarity with the more arcane parameters. Seeing how the factory presets are configured can teach you a lot, and indeed, you can get most jobs done by picking presets ands then tweaking them if you don’t feel confident making all the settings from scratch. When you do get to using them, those filter controls can make a huge difference in adjusting the timbre of a sound, and most adjustments can be verified by ear so you can’t go far wrong. For example, enhancing or suppressing the ring of a snare drum, adding depth to a kick drum, picking out the beater impact of a kick drum, or focusing on the more pleasing harmonics of a bass guitar at the same time as taming excessive sustain, are all easy to achieve. The Warmth control also does exactly as its name suggests and is a welcome addition to the plug-in. Once again, Sonnox have taken an existing idea and added improvements that, once appreciated, might make us wonder how we lived without them. Oxford Envolution is an excellent tool, and I suspect it will find uses that neither Sonnox nor myself have even considered yet. SPL’s Transient Designer is the obvious alternative for straightforward attack/decay control, but there are also other takes on the same principle that offer multi-band processing, such as Waves’ Trans-X Multi. Accentuating the transient part of a signal often increases its peak level and dynamic range, so it can’t be made as loud without clipping. Sonnox Envolution thus features a Warmth control, which applies a saturation-type process to absorb these new peaks while retaining the impression of a more dynamic signal. Set at maximum, peak input signals up to +6dBFS can be prevented from clipping, and of course some harmonic content is added when this section is pushed hard. There’s the ability to blend the processed and dry sounds in parallel, and the output level can also be adjusted. Metering is provided to let you know if things are getting overcooked. Can treat sounds such as drums and bass guitars in ways that were previously difficult or impossible. There’s more of a learning curve than with a basic Transient Designer. Another excellent and genuinely useful tool from Sonnox that has applications across a range of percussive and plucked or struck sounds. Native version £204; AAX DSP version £330. Prices include VAT. 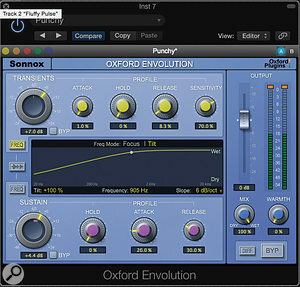 Native version $149.36; AAX DSP version $241.63.